Cinnamon Sticks and Slices. 2 cups sifted all purpose flour 1/2 tsp salt 3/4 cup shortening 2/3 " rolled oats 1/2 or 2/3 cup water Filling 1/2 cup brown sugar 1 tsp cinnamon 1 tablesp. flour For the pastry sift flour and salt cut in shortening until mixture resembles coarse crumbs, mix in rolled oats add water a little at a time mixing lightly until pastry can be formed in a ball, Let rest 5 min. 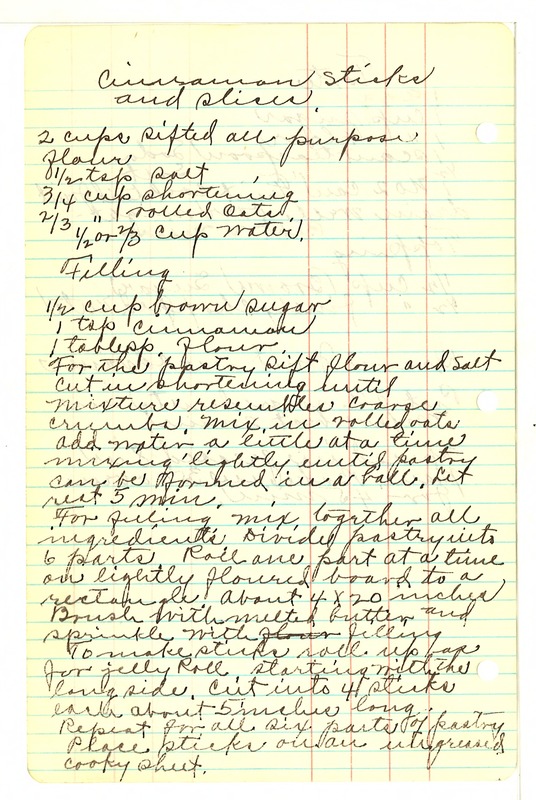 For filling mix together all ingredients Divide pastry into 6 parts Roll one part at a time on lightly floured board to a rectangle about 4 x 20 inches Brush with melted butter and sprinkle with filling To make sticks roll up as for jelly Roll, starting with the long side. Cut into 4 sticks each about 5 inches long. Repeat for all six parts of pastry Place sticks on an ungreased cooky sheet.